Custom window and door treatments to compliment your home’s unique design. Enter your email to receive exclusive monthly deals! Enhancing your homes décor by adding window and door treatments is as easy as choosing the right blinds, shades, or shutters that suit your unique style. At Florida Custom Blinds, we keep things simple for you. Make your appointment with us, view samples in the comfort of your own home, and then sit back while your window and door coverings are professionally and expertly installed. Enjoy lasting durability and versatile design with faux wood, real wood, aluminum, and vertical blinds for your windows and doors. 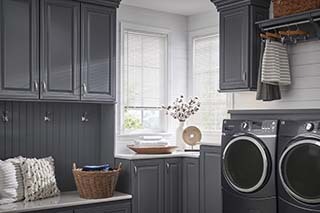 With many options in colors and stains, your home will look beautiful, and at an affordable cost, too. These window and door treatments give a soft and elegant look to your room, while also offering privacy. 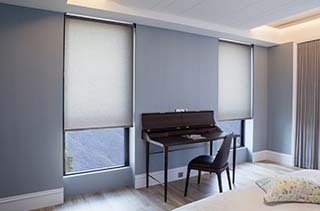 Choose from roller shades, honeycomb shades, woven woods shades, roman shades, silhouettes, pirouettes, luminettes, and more. 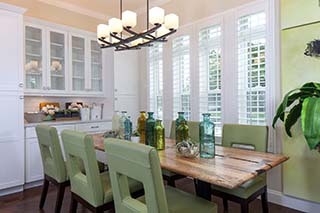 Shutters add value, quality, and a unique look to your home. Easy to maintain and customizable, these window treatments will give you everything you’ve been looking for. Rest easy knowing your children and pets are safe with these coverings. I just can’t say enough good things about Florida Custom Blinds! They recently installed two large solar shades in my sunroom and blinds on several windows in my house. The owner, Julie, came to the house to process the order. She listened as I described what I was looking for and made recommendations as if she were doing the work on her own house. To my surprise the cost was less than I expected for the materials and work. Julie’s installer, Wallace, was prompt, polite, and efficient. He removed my old blinds and offered to dispose of them. In short, my experience with this company was simply outstanding from start to finish. It’s obvious Julie takes great pride in the products she offers and her singular focus on customer service is noteworthy. I highly recommend Florida Custom Blinds and will use them exclusively in the future! There are not enough good words to say about Florida Custom Blinds. They set the bar on what true customer service is all about. Julie is one of the most professional and kind hearted person you would ever want to meet she becomes a part of your family from the first time you meet her. She listens to your needs first and offers the best solution that fits your windows.I’ve used Custom Blinds two years ago and have enjoyed the beauty the shutters have given my windows. I’m now returning to have my master bedroom windows done and couldn’t ask for a better choice. I have highly recommened her to just about everyone I could think of. Thank you for your excellent customer service. We ordered plantation shutters for our entire home. Julie was informative and knowledgeable during her initial visit to take measurements and submit our order. The shutters arrived and were installed in a timely and efficient manner, and the installation team left our home neat and clean. The shutters are beautiful, and they make a world of difference in the appearance of our home (both from the inside and outside). Also, we have been able to reduce the use of air conditioning since the shutters were installed. Thank you to Julie and the installation team. Florida Custom Blinds is the best, there isn’t anyone easier to work with then Julie and Wallace does great installations. We recently moved into our 3rd new house since moving to Florida and Julie has provided the window coverings for all 3 houses. She always arrives on time and ready with the latest trends in window coverings, she never pressures you into buying and stands behind her products 100%. I have recommended Florida Custom Blinds in the past and will continue to do so in our new area. Far exceeded my expectations. The plantation shutters completed the look of my new home. Very polished, clean and welcomes in the sunlight! Very pleased! Julie, I wanted to thank you for the outstanding, timely and on budget blinds you provide us post our remodel. Thank you for your professionalism. Shopped around many places for 2 custom blinds for large windows in the front of our new home. Julie came out and was very patient and helpful while assisting us with making a blind selection. Very professional and provided quality products. Save time and money by going with Florida Custom Blinds. Will definitely use for all future needs.